Divers were sent down to inspect the wreck the following morning after the disaster. It must be remembered that at that time, divers were in a full suit with lead boots and the large copper helmet. They were connected to the surface by a life-line and an air hose. This meant that they were very restricted in their movements and what they could see around them. Submitted from the Diver’s report of his discoveries during the dive subsequent to the Commander in Chief’s visit, it appears that the explosion was an internal one, which occurred near or in the after 9.2” shell room of Natal. Judging from his description of the damage, it is considered practically impossible to salve the ship or move her any distance. The Diver will resume his examination tomorrow to confirm or amend his report. It is interesting to note that after this first dive the opinion that there was no chance of a recovery operation was forming. The very early thoughts from the Flag Officer, just minutes after the explosion was to tow H.M.S. Natal into the Invergordon floating dock for repair. Submitted, the Diver further reports as follows: damage to the Hull is rather more extensive than at first reported. In his third dive, on the morning of the 3rd January 1916, the Invergordon Diver reported that he found another bulkhead blown away and all the scuttles and doors that he found were open. He also confirmed his previous reports of damage. However, the deteriorating weather gave time for HM Salvage Ship “Ranger” to arrive from H.M. Dockyard Rosyth. H.M. Salvage Ship “Ranger” was a specialist vessel that had on board several divers who were able to make assessments of the wreck using the ship’s plans that had been delivered from the Admiralty. On the afternoon of the 3rd January 1916 the task of diving on the wreck and assessing the damage was handed over to Captain Fred W. Young, Naval Salvage Advisor, who was on board “Ranger”. On the 5th January he submitted his final report and recommendations along with the reports of the “Ranger’s” two divers. Commencing from aft on the starb. side, I found the principal damage in the vicinity of the stern gland, extending in length from 12 feet: abaft this to 12 feet: forward from frame 166 to 176, a total length of 24 feet. The plating is blown outward except for a short piece at the after end, where the plates are shattered and have collapsed inward, and are depressed for about a foot in depth. The width of the damage is confined to two strakes of plating from the stern gland upwards, viz. “E” and “G” strakes. I also noticed that a bulkhead at about 172 frame was blackened by fire. I also found an inlet grating valve, 9 inches in diameter, intact on the damaged plating, and 9 feet abaft this there was a 3 inch outlet pipe. The frames attached to the broken plating are sticking outboard and the stern gland is intact at the bulkhead. From the general appearance of the fractured plating, I am strongly of the opinion that the explosion occurred inside the vessel. I hereby certify that in conjunction with Charles Lambert, Chief Diver, I descended twice on the 4th January 1916, first on the flood tide and afterwards on the ebb tide at low water. Commencing from aft on the portside at about 190 frame to 180, I found the keel practically unbroken and from there for about 18 ft. it is shattered, landings started and rivets out and the keep depressed. The side plating is blown outwards in a very irregular shape and apparently extends to the armour plating, but owing to the great quantity of electric wires, ropes, and broken or jagged plating, I was unable to ascertain the exact extent on the lower side near the deck, although I am of the opinion that the damage was more extensive on the port side. On the starboard side of the keel, in between the broken plating, I saw a box of 3 pdr. ammunition, some of the rows being intact with safety clips on. From the result of my examination, I am of the opinion that the explosion took place inside the ship. At low water, I examined the vessel along the port side forward and from aft forward and found the lower edge of the deck deeply embedded in the mud. At the forward end of the grating, which I took to be a net shelf, I found a gun parallel with the bottom about 4 feet above the mud. … IV. After careful consideration of the later reports of the divers, I am confirmed in the opinion expressed in my submission dated 1st instant, namely that it is practically impossible to salve the ship or to move her any distance. V. As the wreck now lies practically bottom up, it would be most difficult and hazardous an operation to attempt to remove any of the large articles on board, and it is questionable whether the value of the articles so recovered would justify the risk entained in the operation. These reports were quickly sent to the Admiralty in London and a letter was sent from the Admiralty to the Commander in Chief Home Fleets that was received on the 16th January. It was marked “Secret”. With reference to your letter dated the 6th instant, No 48/H.F. 0021, reporting upon the prospects of salving H.M.S. 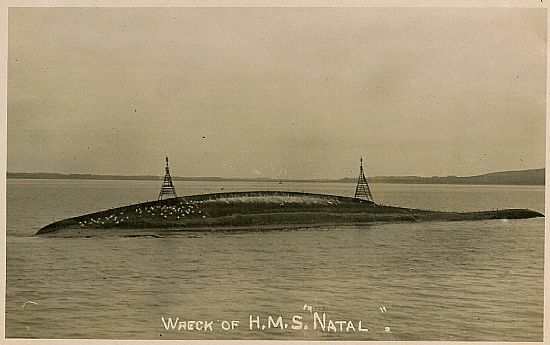 “Natal”, I am commanded by my Lords Commissioners of the Admiralty to acquaint you that they have decided that no attempts at salvage operations on this vessel are to be undertaken. 3. A duplicate of this letter is being sent to the Vice Admiral Commanding, Second Cruiser Squadron. An early picture of the hull of HMS Natal showing the navigation lights mentioned in the Admiralty letter of 13th January 1916. With this letter from the Admiralty begins the long history of the hull of H.M.S. Natal in the Cromarty Firth that goes into the twenty first century.